Lifeboat volunteers have rescued a sheep and a dog after the animals fell from cliffs on the Ceredigion coast. Murray the dog had been walking along the coastal path with his owners when he fell over 50ft (15m) off a cliff between Tresaith and Aberporth. A volunteer crew set off from New Quay in search of Murray after 13:00 GMT on New Year's Eve. "We had a bumpy run down the coast but luckily we were able to locate the dog quickly," volunteer Simon Rigby said. The dog had broken one of its front legs, was in a lot of pain and had to be extracted from a small cove. "We got him on board and handed him over to the Cardigan Coastguard rescue team on Aberporth beach where Murray was reunited with his owners." 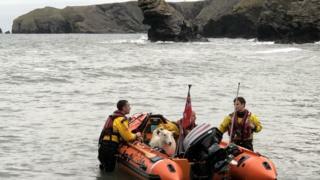 On their way back to New Quay, the lifeboat was asked to rescue a sheep that had fallen over a cliff near Llangrannog. "We couldn't believe that the sheep had fallen over 80ft (24m) but had survived completely unscathed. She must have landed in the water and swum to nearby rocks where we found her stranded," crew member Ben Davies said. "I never thought when I joined the lifeboat crew I would be lassoing a sheep and getting the poor thing into a boat. Luckily the sheep was very calm on board but we had to tie her down for her and our safety." The sheep was taken to Llangrannog where it was handed over to the New Quay Coastguard team.